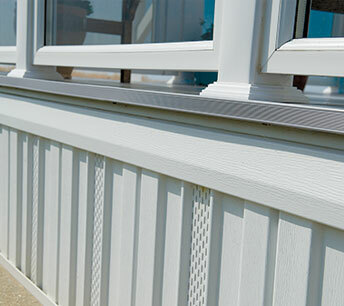 Having uPVC skirting installed at your static caravan or holiday home sundeck adds more than cosmetic finishing touches. Available in matching colour palette to ensure your caravan skirting complements your holiday or park home. Fully enclosed uPVC skirting provides protection from wind and cold and stops debris and small animals getting under the home. Our simple track system allows a single panel to be removed for easy access. 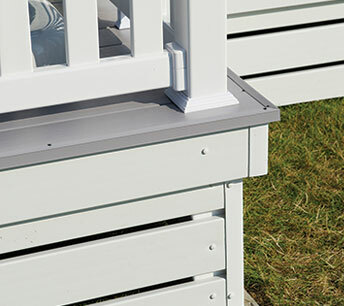 Our decking skirting is available in White and Cream or in vinyl wrapped Dark Green, Dark Brown, Golden Oak or Slate Grey supplied with two access gates as standard (more are available on request). Fitted by our team of professional installers to ensure your static caravan skirting is the perfect finish. A must with Ranch Style decking Skirting these gates allow quick and easy maintenance access, fitted with our own top quality fixings to ensure no rust or corrosion. 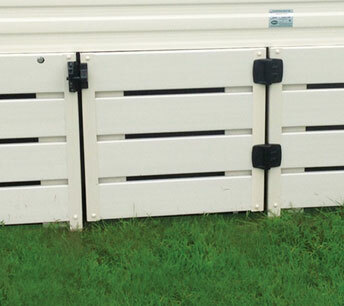 Two gates are fitted as standard with every Ranch style skirting order and more are available on request.